Engine oil loss is a severe problem in today’s engine development. Downsizing engines together with turbocharging, reducing piston ring thickness in combination with increased cylinder pressures result in engine oil loss. Minimizing oil loss requires knowledge of the engine states in which it occurs. Especially for transient engine operation real-time measurement instrumentation is obligatory in order to obtain time resolved oil consumption profiles. 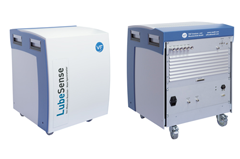 The V&F LubeSense has been specifically designed for this task. In combination with the V&F GasOxidizer oil consumption rates can now be determined online by means of the SO2 tracer method. Forward to the LubeSense product page.